Bequia Birds Bird stamps from Bequia. Bequia is the largest island in the Grenadines. It is part of the country of Saint Vincent and the Grenadines, and is approximately 15 km from the nation's capital, Kingstown,and is nine miles away from st.vincent. The island capital is Port Elizabeth 13°00′N 61°16′W. Other villages on the island are Paget Farm, Lower Bay, La Pompe, Hamilton, Mount Pleasant and Belmont. The total population is about 4,300, the native population being primarily a mixture of people of African, Scottish and Carib Indian descent. A substantial number of white Barbadians were also sent as settlers to Bequia in the 1860s. A number of them built homes in the Mount Pleasant area where many of their descendants still live today. The island is very small, measuring some 7 square miles (18 km2). The main population areas are Port Elizabeth and Paget Farm which host the Ferry Terminal and Airport respectively. Other prominent areas of Bequia include Spring, site of a former coconut plantation and home to agricultural animals, Industry Bay, Lower Bay and Park Bay,The Old Hegg Turtle Sanctuary is located here. Princess Margaret, who had a home on nearby Mustique, visited Bequia and had a beach named in her honour. Princess Margaret Beach is next to Port Elizabeth and is situated inside Admiralty Bay. 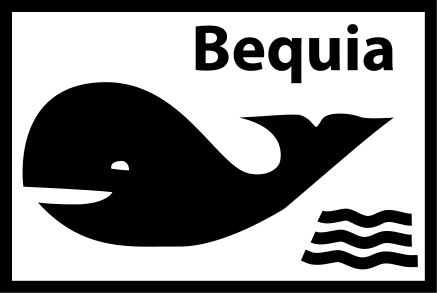 Bequia means "island of the clouds" in the ancient Arawak. The island's name was also 'Becouya' as part of the Granadilles. The islands' unofficial anthem is considered to be 'Only in Bequia,' by island native Raphael "Socony" Holder. The island's hills are much lower than the peaks of St. Vincent, 10 miles (16 km) to the north, so they do not receive as many rain showers. The main port Admiralty Bay, a large natural harbour, and the "town" Port Elizabeth are situated on the west coast. Bird stamps from Berlin, West. Bird stamps from Belgian Congo.